Sections of a Roman road have been identified running from Great Dunmow to Chigwell (the High Road). 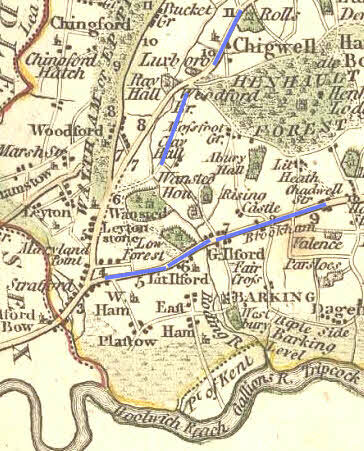 A continuation of the route from Chigwell to Wanstead is suspected 1 (which would involve crossing the River Roding by what is now the private Roding Hospital). John Shepherd speculates that another Roman road from Chelmsford / Caesaromagus joined the Dunmow / Durolitum road on the east side of the crossing, which may then have been affected by the tides 2.